Well, I keep coming back to saisons as a style I am enjoying more and more. My first attempt at a saison was good, but not really where I wanted it. It never really dried out as it was supposed too, and the take home lesson I got from that was don’t trust WLP 565 or Wyeast 3724 to get the job done alone. This yeast is famous for not finishing, and getting “stuck” around 1.020. So to rectify this, I decided to try a different strain. I was going to use wyeast 3711, but I decided to give East Coast Yeast #8 a try. This is blend of 3 yeasts from 3 different saison breweries. According to a post I read from the owner/producer of East Coast Yeast, the yeasts are from Dupont, wyeast 3711 (supposedly Brasserie Thiriez) and Fantome . As I enjoyed beers I had from all of these breweries, this looked like the best option. Given this is a beer I was likely going to be drinking in the summer, I figured a high bitterness with a nice citrusy twist with the hops would be the way to go. So, I decided to try two hops I had not used before known for contributing citrusy and fruity flavors, sorachi ace and simcoe for the bittering, and to split the batch. One gallon was bottled as is, then the remaining 4 gallons were dry hopped with 1/2 oz of Sorachi Ace. I then bottled 2 gallons of this after 1 week of dryhopping, and added 1/4 oz of Simcoe, let that sit for another week, then bottled that. The net effect is I ended up with 3 versions, one “plain”, one dry hopped with just sorachi ace, and the other dry hopped with sorachi and simcoe. Here was the recipe. The OG was 1.056, the FG was 1.006 for a ABV of 6.5%. The total bittering was 41.7 IBU. This was a simple infusion mash at 150F for 75 minutes to try to max out fermentability. Tasting: No dry hop — cloudy, orange color, thin head, not very carbonated. Nose is earthy/musty and spicy, clove at first, with some lemon, pineapple in the background. Little malt bready aroma as well. The taste is spicy, some orange/lemon with some malt sweetness finishing dry and fairly bitter. The mouthfeel is pretty smooth, you can taste and feel some malt there. Dry hopped Sorachi: Cloudy, orange color, thin head, more carbonated then the others. Nose is citrus and grassy, with some spice. Don’t smell much malt on this. The flavor is more fruity and what I would call juicer then the one that was not dryhopped. It seems more rounded, much less earthiness, more lemony. Finishes very dry and bitter with a citrus aftertaste. 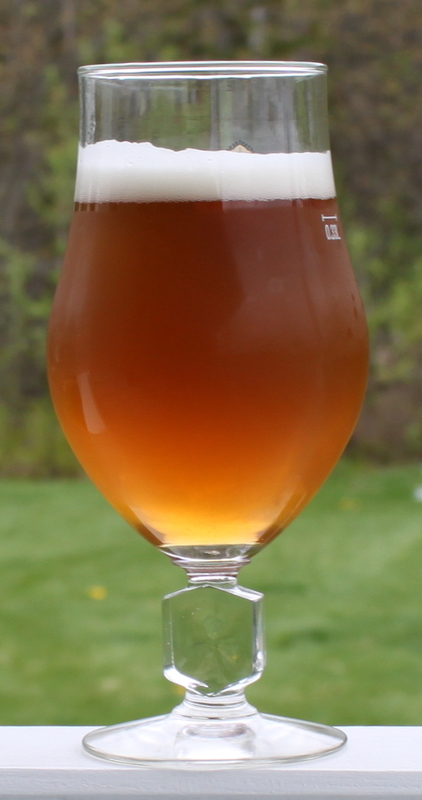 Dry hopped sorachi and simcoe: Cloudy orange, the head is very thin. The nose is very fruity, kind of like a fruit punch, mango, pineapple, citrus. It overwhelms everything else. The fruit carries through to the taste, with the mango jumping out at you. There is a spiciness in there, and again, it is pretty dry and bitter. This is more rounded, and the most “juicy” of all of them. For fun, I pulled out a bottle of my Saison from 2010. I had a few bottles from off the keg, and decided to pour this as a comparison. The color is almost identical, orange, bit of haze. Much more carbonated then the others. It has a very strong pronounced nose of pineapple and mango, with some spiciness like nutmeg, and some of that Saaz floweriness in the background. The taste is very smooth, banana and pineapple up front, followed by a slight spicy bite, and with some residual honey like sweetness at the finish. Not nearly as bitter and much heavier then the other beers. Critique — I asked my wife to taste them all with me, and her favorites were the dry hopped with Sorachi and Simcoe, as well as the Saison from 2010. However, she did state “they are so fruity, I can see a lot of people not liking them, and preferring the more musty taste of the first two” referring to the no dry hop and the sorachi dry hop. The saison from 2010 is just so incredibly fruity, and being as that beer was not dry hopped, that is entirely from the yeast. It is also glaringly sweeter and thicker which makes sense since the yeast stopped at 1.016 and did not go any further. It is also 15 IBU’s less then this more recent saison. My favorite is the beer that was dry hopped with just the sorachi, but I did enjoy the Simcoe/sorachi blend. The straight was my least favorite. The Simcoe you do have to be careful with, because it tends to overpowers everything. The reason I preferred the Sorachi alone is you can still get some of the earthiness from the yeast in the Sorachi alone beer, but you still get the citrusy notes from the dry hop, and for this balance, I think it was my favorite. I am also very happy I had a chance to compare the beer made with Wyeast 3724 and East coast yeast #8 side by side. The Wyeast is incredibly fruity, the ECY#8 is far earthier. Now, the “fruity” and “earthy” things are relative. These beers are all flavor bombs, so we are basically comparing beers at the extreme of yeast driven flavor as it is. However, the differences are glaring. The ease of using ECY#8 and the dryness it produced pushes it higher in my esteem then the Wyeast, but I can see someone using the wyeast combined with a more aggressive yeast (nottingham or Safale 05 come to mind, and I think something like WLP 530 or 550 would be very interesting) to help dry the beers out but still get a great flavor profile. The more I drank these saisons, the more I thought of the comparison in the wine world to New Zealand sauvignon blancs. These wines, which are very food friendly and work well with lighter summer fair, are dry, crisp, and jam packed with tropical fruit flavors. I think this pretty accurately describes the saison’s from this batch, and I look forward to trying them with various dinners over the next few months as I get to enjoy the Nirvana that is summertime in Maine.